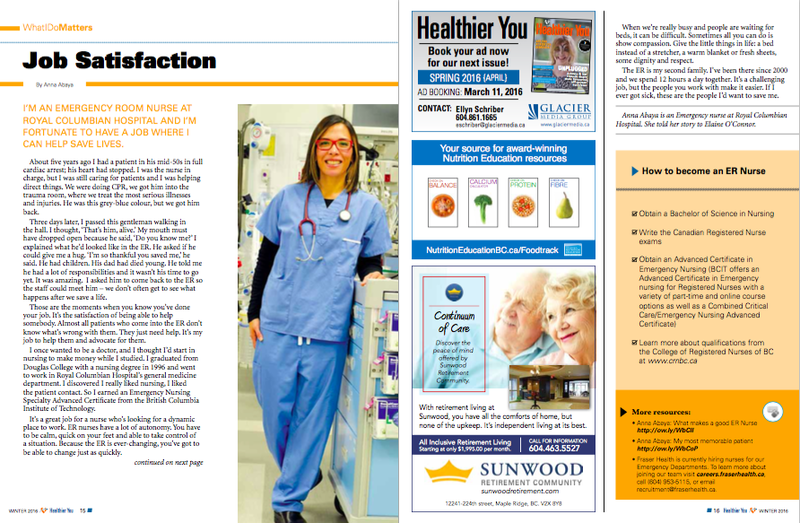 In the most recent edition of Fraser Health’s quarterly magazine, Healthier You, I spoke with Royal Columbian Hospital ER nurse Anna Abaya. She shared her inspiring career journey and detailed how she helps patients overcome trauma and get their lives back. The connections she makes are often amazing. She described the shock of meeting one patient she brought back from the brink of death later walking the hospital halls. And the joy that she and her patient shared as they reconnected and gave thanks for a life-changing moment. You can read her story here, or listen to her share her passion for emergency care in her own words in this video. I’m delighted to be working with Fraser Health as a senior communications consultant. As a former newspaper reporter, I now engage in journalism with a call to action: improving the health of British Columbians. Specifically, I’m working to better the lives of the more than 1.6 million residents who live in the Fraser Health region via public health education and awareness campaigns. Patient-centered care is a cornerstone of BC’s health care philosophy. Fraser Health believes even the smallest gesture matters when it comes to humanizing and personalizing patient care. A few months ago, we published our 2015 Year of Caring series to highlight the exceptional, yet everyday actions of our front-line staff. These unsung heroes demonstrate our core values of respect, caring and trust, making transformational connections with their patients and clients. We were honoured to share their stories. Have a read and stay tuned for more stories from the front-lines of BC’s health care system. While travelling in Asia on a media fellowship last year I spent time in Seoul, South Korea reporting on international education for The Province. In between interviews I had time to explore the city. I was captivated by Seoul’s urban exotic charms: ancient palaces in view of skyscrapers, neon megamalls encircled by rustic food stalls, and most of all the city’s round-the-clock street carnival of shopping, eating and carousing into the early hours. Explore the sights and scenes of the city with a read of my latest travel piece, Exotic Seoul: Ancient Palaces to Neon Modernity, published in The Vancouver Sun, with photos in this gallery. Nearly half a million students in B.C. public schools were kept out of class in the first weeks of September 2014 due to the ongoing teachers’ strike. Yet some 10,000 pupils in B.C. schools did start their school year on time — the difference is these were students registered in certified B.C. offshore schools abroad. There are currently 42 of these provincially-approved institutions located in China, Korea, Thailand, Egypt, Qatar and Colombia, each staffed with B.C.-certified teachers teaching the B.C. curriculum to foreign nationals. The schools issuing Dogwood diplomas upon graduation and net B.C.’s Ministry of Education more than $4 million in revenues each year, yet few B.C. residents are aware of them. In my latest three-part series for The Province, I explore the phenomenon of B.C. offshore schools, focusing on a new crop of schools that have sprung up in Korea. In part two, the series also looks at recent trends in international education here in B.C. public schools, where foreign students who move to study in local schools now contribute $139 million a year to strapped school district budgets. And in part three, I examine how B.C. and Canada both fall short in creating a truly reciprocal international education system, as we send so few of our own students abroad on study exchanges. Funding for the series comes courtesy of a media fellowship from The Asia Pacific Foundation of Canada, sponsored in part by Cathay Pacific Airways. Have a read and gain a new perspective on the education sector in our province. I’m delighted to have been selected by the Asia Pacific Foundation of Canada as one of their Media Fellows for 2014. The APF is an independent think-tank on Canada-Asia relations, headquartered in Vancouver. This fellowship, funded in part by Cathay Pacific Airlines, will allow me to travel to South Korea later this year to conduct research for a report on B.C.-Asia international education. I’ll be examining in particular the close ties between British Columbia and South Korea and how the flow of students between these two countries informs each country’s educational system, economy, and cross-cultural understanding. Stay tuned for links to these stories later this year.